On March 19 this year, it will be the 81st anniversary of the opening of the Sydney Harbour Bridge. It’s an iconic symbol of Sydney, and of Australia itself; Sydneysiders refer to it with affection as “The Coathanger”, and more respectfully as “The Grand Old Lady”. The place where the bridge stands today is where Europeans first set foot on Australian soil, back in 1788. There are many famous names connected with the bridge that I could cover, but when I think of its history, I see its true heroes as the workers who toiled long hours to build it, without any modern safety equipment, often risking their own lives in the process. So I dedicate this blog entry to the stonemasons who worked on the Sydney Harbour Bridge. The bridge’s pylons are 89 metres high, made of concrete and faced with granite. While much of the steel for the bridge was imported from Britain, the materials for the pylons are all Australian, with most of the granite quarried from the seaside town of Moruya, 300 km south of Sydney. The pylons were designed by Thomas Tait of Scotland, and many of the stonemasons who worked in the quarry were from Scotland and Italy, as well as Australia. There were perhaps 300 masons in all, who cut and dressed 40 000 stones for the pylons, with just two stonemasons facing them with granite. The stonemasons also built the Cenotaph in Martin Place, which commemorates all those who died during the Anzac campaign. You can read more about the building of the bridge and those who worked on it in this little booklet from The Pylon Lookout. 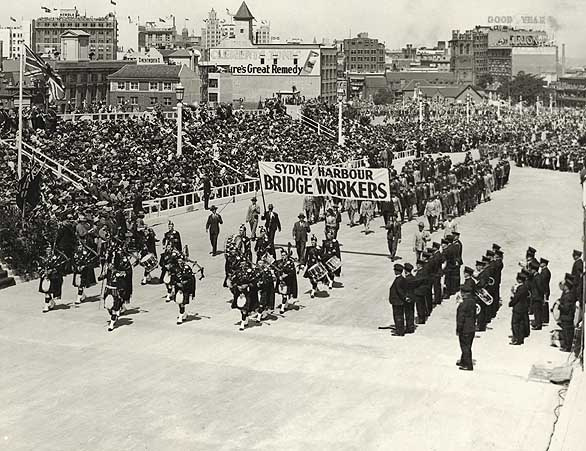 When the bridge was opened in 1932, the foreman stonemason, Jock McKay, proudly led 100 workers at the start of the Bridge Parade. We’ve already learned that it was the Stonemasons Association which first campaigned for an eight-hour working day, so this was another landmark day for them. Mason is an English surname which is easy to understand, as it refers to the occupation of being a stonemason. It comes from the Old French word masson, introduced by the Normans; the word is derived from an ancient Germanic word meaning “cut, hew”. Mason is one of the oldest English surnames, being found from the early 12th century. The trade of masonry is likewise one of the the most ancient, dating back to the Stone Age and the dim beginnings of civilisation. Indeed, when we think of the great works of civilisations, we tend to focus on their building projects, such as Egyptian pyramids, Greek temples or Roman aqueducts. During the Middle Ages, when the surname Mason first began to be used, masons were in demand for building castles and cathedrals, and they had a high status as skilled craftsmen. I think from its earliest beginnings, stonemasonry had a spiritual or religious side, for the first large structures seem to nearly always be temples or other places of worship. It seems probable that the building of such temples would involve knowledge of spiritual symbols and motifs to be worked into their designs, and even the mathematics necessary to design such a temple may have seemed almost a magical art – it certainly required high intelligence, and greater knowledge than the average person. The organisation of Freemasonry, or the Masons, seems to draw on myths that stonemasons were given secret knowledge that was handed down through the generations. These always seem to go back to the architect of King Solomon’s Temple of ancient Jerusalem, but includes Euclid, Pythagoras, Moses, the Essenes, and the Culdees, with Noah, the ancient Egyptians, the Knights Templar and the Druids thrown in for good measure. Even Jesus Christ is claimed as a Freemason, with his assertion of being the prophesied “cornerstone” a supposed indication. These myths seem very far-fetched to me, but I can see how they might have an extremely tiny grain of truth to them, and they do add a bit of intrigue to stonemasonry and the name Mason. Mason has been used as a first name for boys since at least the 16th century, and seems to have originated in East Anglia. It’s much more common in the United States than elsewhere, and that may partly be because of the distinguished Mason family of Virginia, which has played a prominent role in American history and politics. George Mason IV is considered one of the Founding Fathers of the United States, and an author of the Bill of Rights. In Australia, although Martin Mason was one of our first pioneers, I tend to think of it as a rather sporty name, because of hockey player James Mason, cricketer Scott Mason, NRL star Willie Mason, and AFL player Mason Wood, from the North Melbourne Kangaroos. Mason first charted here in the 1980s, debuting at #429 for the decade, and rose steadily to make the Top 100 by 2005. The year after Kourtney Kardashian welcomed her son Mason in 2009, Mason jumped 36 places in the charts, and rapidly ascended to #24 in New South Wales for 2012. (Although often connected with the Kardashians, Mason is quite the favourite amongst celebrity baby namers). Name data for 2012 in so far shows Mason as one of the fastest rising names in Queensland, Western Australia and the Australian Capital Territory, and Top 20 in Queensland, Western Australia and Victoria. Mason is a name which denotes physical strength applied skilfully, and even has quite a spiritual side to it. It would be a great name to honour a tradition of stonemasonry in your family history, or a tradition of skilled craftsmen. Although we think of it as quite a modern name, it has a very long history, and is far older than most surname names. It is rising in popularity, but mostly not soaring like a trendy name; more the solid progress of a name set to be a modern classic. There is plenty to appreciate about the name Mason, but one thing you can’t hope to do is keep it to yourself. POLL RESULT: Mason received an approval rating of 26%. People saw the name Mason as too trendy (23%), too popular (21%), too much of a celebrity baby name (10%), and rising too quickly in popularity (9%). However, 7% thought the name was strong and handsome.